When would a Double Bag Setup be used? When watering a newly planted tree from 4 to 8 inches in trunk diameter (caliper), wrap a Double Bag setup around trunk. How much water can a Double Bag Setup hold? 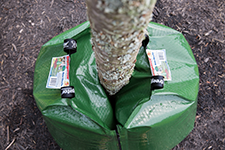 When two Treegator® Original Bags are zipped together back-to-back, it allows each bag to expand more than it normally would when zipped to itself around the trunk of a tree (Single Bag setup). The amount of water each Treegator® Original Bag can hold when used in a Double bag setup is dependent upon the caliper of the tree it is being used on. How long does it take for a Treegator® Original to empty? It typically takes approximately 5 to 9 hours* for a Treegator® Original to empty. Why doesn't it take longer for a Treegator® Original to empty? When watering, you want to water as deep as possible... not necesarily as long as possible. Watering slowly is the best way to get water deep below the soil - but, watering too slowly causes the majority of the water applied to evaporate before it reaches the root system. 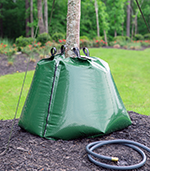 Treegator® Bags are designed to provide deep water saturation with no run-off in the least amount of time necessary...You'll water your trees and shrubs more efficiently and effectively than conventional methods and spend less time doing it. Why doesn't a Treegator® Bag need to be filled every day? A Treegator® Slow Relese Watering Bag delivers water deep below the soil surface with no run-off - every time. This means that there is now a high concentration of moisture within the entire soil profile that your new tree or shrub can feed from - potentially for several days. And, after a deep watering application, allowing the soil to begin to dry out will help encourages deep root growth. Keeping the soil too moist for too long, or poor drainage at the planting site, can remove the oxygen available to the roots from within the soil and kill a tree or shrub.